Last night I did something I haven’t done in a long time – engaged in an on-line abortion debate on twitter, using hashtags like #Prochoice and #Abortion. Yes – crazy, I know, but I was doing it with a purpose. I wanted to test some insights I gained over the last year. I laughed when some of my followers couldn’t make sense of what appeared to be a very bizarre conversation. Yesterday was BlogForChoiceDay promoted by NARAL, formally National Association to Repeal Abortion Laws – then National Abortion Rights Action League – and now no longer an acronym – just NARAL. Abortion advocates play loopy semantic games, distancing themselves from the word “abortion”. It’s easy to see why – with legal defense for partial-birth abortion, and madmen like Kermit Gosnell the people of the United States are beginning to understand abortion is like a bad addiction we can’t control. 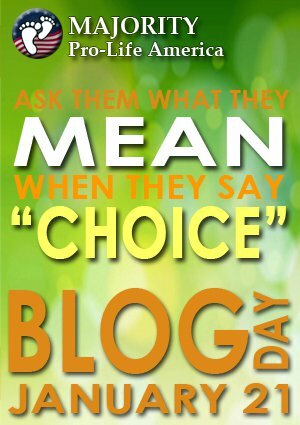 Given the upcoming anniversary of the Roe vs Wade decision, Jill Stanek decided to confront NARAL with a “Ask Them What They Mean By ‘Choice’ Blog Day”. I’m happy to say advocates of life stepped out in force – to address the evasive rhetoric. I’d like to think reasoned response would be effective, but that requires reasoning on the other side. There was simply no sign of that. Words and rationale have become meaningless to many young abortion advocates. They make statements like “Prochoice is Prolife”. They throw infantile slurs at you. One even claimed she never was a fetus. She was being serious. When confronted directly about why they advocate abortion – if it’s because they had one – they are evasive. If abortion were beneficial as they claimed, then why cover-up or deny it? I have no problem telling people I had a lower abdominal hernia repair. If you are advocating what you’ve never personally experienced, why should your advice be accepted as credible? Every woman who has personally shared with me indicated the adverse impact abortion has had upon her life. How could you not? It’s unnatural to have any medical implement shoved deep inside you or to take a regimen of pills to bleed out the developing child. Women suffer from miscarriages. To deny women don’t suffer from abortion is crazy. It is most likely the word “crazy” came from the Greek word “akrasia”. Selection of words is powerful – it can change minds, particularly your own. But that’s not always a good thing – particularly for the post-abortive. The lesson I walked away with last night was my need to choose my words carefully – treating each prochoice advocate as post-abortive. Responding maliciously would have driven them further from the path of reality, and further into dark despair. Denial is a painful thing – the lash-outs, the warps and twists of logic, the evasiveness, the defense of the indefensible, the abandonment of reason and rationale doesn’t call for our condemnation – it’s evidence of a need for compassion and enduring love. The most telling indicator in our arguments last night – all respondents fell silent, confused when confronted with love. That’s what’s lacking when they take their child. That’s what’s missing when they promoted abortion of other children. That’s what we need to provide for them and towards them.